5 Dear friend, you are being faithful to God when you care for the traveling teachers who pass through, even though they are strangers to you. 6 They have told the church here of your loving friendship. Please continue providing for such teachers in a manner that pleases God. 7 For they are traveling  for the Lord, and they accept nothing from people who are not believers. 8 So we ourselves should support them so that we can be their partners as they teach the truth. Greek, they went out on behalf of the Name. Unspecified in Bible text, I have made the scene late morning. The sun (above & behind the viewer) warmly lights this scene. From left to right: a travelling preacher, Giaus (the recipient of the letter), a man in green (who belongs to the local church) being roughly thrown out by Diotrephes wearing a red robe (probably an elder of that church) & another travelling preacher. This short, personal letter (probably penned by the apostle John) was sent to a man named Gaius; in Latin that names to rejoice. It is not known where Gaius lived, but it is likely that he belonged to a church somewhere in Roman Asia (now western Turkey). The author of the letter seems to have been urging Gaius to show hospitality to Demetrius (refered to by name in verse 12) who was evidently a travelling Christian preacher. Demetrius may well have been the bearer of the letter. This is a composite scene, showing the contrast between verses 5-8 & 9-10. I have used the corner of the building (which is a church building, by the way) as a natural divider between the left & right hand sides of the scene. Gaius & the good side of the picture. In verse 5-8 the writer of the letter acknowledges the “loving friendship” of Gaius (verse 1, the receiver of the letter). That sentiment is represented by the left hand side of the scene, in which we can see Gaius warmly welcoming a travelling preacher. 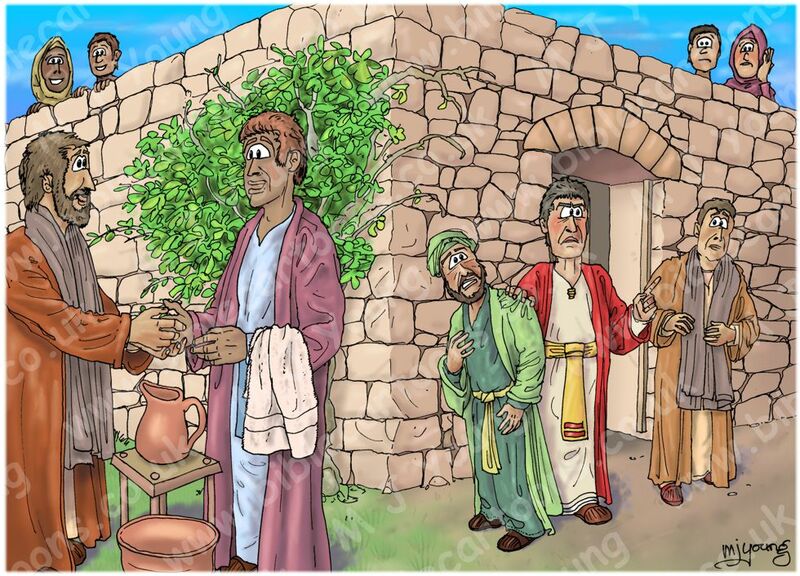 Gaius has provided water & a bowl for the preacher to wash his feet, which was a standard way of attending to a visitors immediate needs. 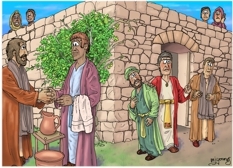 You can see Gaius has extended his hand in friendship, & the arriving preacher (Demetrius) is warming grasping his hand. Notice the woman & child onlookers on the building’s wall, above these two figures, who look happy, which reinforces that this side of the “action” is positive, friendly & welcoming. Behind Gaius is a fig tree, which is looking healthy, & the ground below the feet of the figures is lush green grass. All of these things are my visual clues to help the viewer recognise the good side of the equation! Diotrephes & the bad side of the picture. In contrast to Gaius welcoming the travelling preacher on the good side of the scene, we have the contrast: In verses 9-10 the writer refers to a man named Diotrephes, who’s attitude was anything buy welcoming to these visiting preachers! I deliberately chose colours for Diotrephes that remind us of the Roman empire, he wares a red robe, with pale toga-like robes below. He has a golden sash & an imperious, disapproving expression on his face! Diotrephes has a raised finger & is telling a travelling preacher that he is not welcome at the church (the building behind the figures). Notice that Diotrephes has grabbed a man in green (a member of the church who is sympathetic to the travelling preachers) & is about to throw him out of the church! All of this we know from verse 10. Notice the 2 figures on the wall above Diotrephes, who are looking shocked & dismayed at his unfriendly, unhelpful attitude. I have deliberately drawn the ground as lifeless & dusty (in contrast with the good side of the scene!) with no grass growing. Also notice the branches of the fig tree on the Diotrephes side of the scene are withering & dying, with only a few curled up leaves. This is a visual indicator of Diotrephes’ attitude – that he is metaphorically killing the things which should be growing & flourishing. Diotrephes refusal to help travelling preachers & his wanting to be the leader (verse 9) is like a choking hold on the church & could result in stunting the life of the church. Beware people who want to be leaders but do not demonstrate the attitudes of love, care & self-sacrifice required to actually BE good leaders!